How works the search panel? The search panel is the entry point of Onyx Fixture Finder. This User Guide will help you to use it. 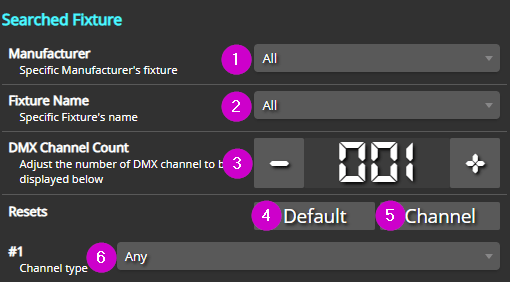 The number of DMX Channel is used to search, but also to add in the form as many select channel type as number of DMX Channel set. You can set manually the value between 1 and 512, or use the + and - buttons. 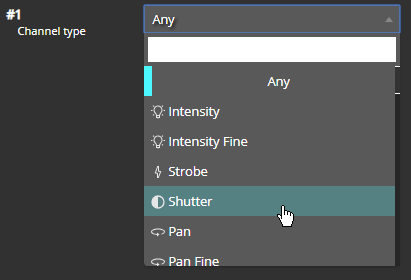 This button allow to quickly reset the select channel type to "Any". Note: It does not reset the search settings, manufacturer, name and DMX Count.